Ramadan — the month of fasting — is linked with a number of important events in Islamic history, the most important of which is the revelation of the noble Qur’an from on high (2:185). Both the descent of the Qur’an from the lawhun mahful (the Well-Guarded Tablet), where it is inscribed till eternity (85:21–22), and the revelation of the first few ayat to the noble Messenger (SAW) in the solitude of the Grotto of Hira, occurred in Ramadan. In the Qur’an, Allah (SWT) has referred to that night as laylah al-Qadr (the Night of power – 97:1–5) and laylah al-Mubarakah (the Blessed Night – 44:2). Ramadan also registered the victory of the early Muslims in the Battle of Badr in 2 AH, as well as the liberation of Makkah, which took place in 8AH. An estimated 10,000 Muslims marched on Makkah to free it from occupation and marginalization by the exclusivist forces represented at that time by the mushrik Quraysh. The Ka‘bah, the sacred House of Allah (SWT) on earth, was cleansed of all idolatrous accretions, in physical form as well as the associated 'asabiyyahs, that had polluted its sanctity for centuries because of the jahiliyah that pervaded Arabian society at the time. O You who are securely committed to Allah! Fasting has been ordained for you as it was ordained for those before you, so that you may protect yourselves against Allah’s corrective justice” (2:183). It is He who sent down to His servant [Muhammad] the Furqan [the Qur’an — as the criterion by which right can be distinguished from wrong] on the day [of Badr] when the two parties met (8:41). Badr was a model because participation in that great encounter became the hallmark of committed Muslims. The Companions of the prophet (RA) were later categorized as “those that witnessed Badr” and “those that came after.” The Battle of Badr registered for all times to come the power of the people over the power of tyranny, the power of the street over the power of the palace, the principled power of man against the concentrated power of satan, and the power of truth over the power of racism, nationalism, tribalism, exclusivism, and narcissism. It was the month of Ramadan in which the Qur’an was [first] revealed from on high as a guidance unto man and a self-evident proof of that guidance, and as the standard by which to discern the true from the false (2:185). While the Qur’an was first revealed in the month of Ramadan as “Guidance unto Man,” Allah (SWT) also emphasizes that only those who have taqwa will receive guidance (2:02). one way to build taqwa is to fast in the month of Ramadan (2:183). But fasting must mean more than merely abstaining from food and drink for a specified number of hours during the day, even if this may be an arduous task especially when Ramadan falls in the long, hot summer months. While fasting is meant to develop self-restraint among individual Muslims, it must also arouse the social consciousness of observant Muslims for the plight of those suffering in humanity. The personal conformity of an individual Muslim to Allah (SWT) must be linked with his social conformity to Him and His creatures. The combination of what is personal with what is social teaches us that we cannot separate ourselves from the world around us. fasting should act as a powerful reminder of this social responsibility failing which our fast will be little more than an exercise in dieting. 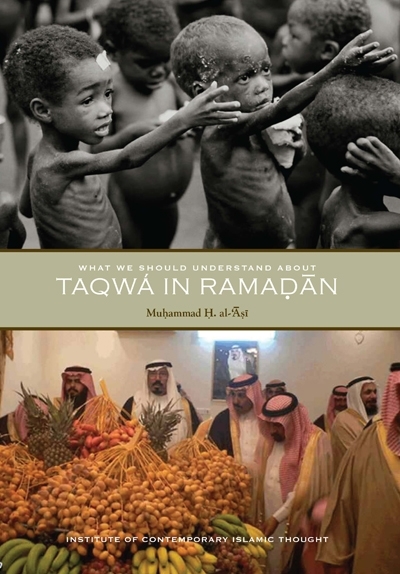 The building of taqwa has also been made contingent upon sharing our wealth, even if we cherish it ourselves, with near relatives, orphans, the poor, the homeless, those who deserve pity, and those whose freedom is limited, such as prisoners or indentured laborers (2:177). In our ceaseless effort to achieve taqwa so as to seek guidance from the Qur’an and, therefore, become deserving of Allah’s (SWT) grace and mercy, we must be cognizant of the needs of those less fortunate than ourselves. our voluntary abstinence from food and drink should enable us to empathize with the millions of needy souls that go hungry or even sleep in the street every night because of inbuilt inequalities, despite plenty of food and other resources available to cater to the needs of everyone worldwide. In order to grasp the magnitude of the problem more accurately, let us first consider some statistics relating to the wide disparities that exist in the world today. of the nearly seven billion people worldwide, at least 925 million do not have enough to eat. Almost all of these people (98%) live in what is referred to as the “developing” world.1 Two-thirds of the world’s hungry live in just seven countries: Bangladesh, China, the Democratic republic of Congo, Ethiopia, India, Indonesia and Pakistan.2 Nearly half of Afghanistan’s 25 million people live at or below the poverty line — $1.25/day — as determined by the World Bank.3 Based on the World Bank’s threshold for extreme poverty, 1.4 billion people, or one-fifth of the world’s population, cannot meet the minimum consumption and income level to fulfill their basic needs.4 The worst cases of hunger are found in Asia and the pacific, primarily Pakistan, India, Bangladesh, China and Indonesia (578 million); sub-Saharan Africa (239 million); and Afghanistan and North Africa (37 million).5 The overwhelming majority of poor reside in Muslim countries: Afghanistan, Pakistan, Bangladesh and Indonesia. Add to that the poor in India (400 million, again many of them Muslims) and we begin to get a glimpse of the magnitude of the problem in the Muslim world, as well as the world at large. It is, however, the plight of women and children that should arouse the greatest concern. More than 60% of the world’s hungry are women.6 Closely related to this is the fact that one out of every six infants is born with a low birth weight in developing countries.7 According to the British charity, save the Children, malnutrition is the key factor contributing to more than one-third of all global child deaths resulting in an annual death rate of 2.6 million.8 In sub-Saharan Africa, one-third of all child deaths are the direct result of hunger and malnutrition.9 Globally, a child dies every five seconds from hunger-related diseases.10 UNICEF, the united Nations body tasked with looking after children’s needs, reports that 22,000 children die each day due to conditions of poverty.11 Is it enough to feel bad about these pressing facts in Ramadan (and take it easy the rest of the year)? Allah deprives usurious gains of all blessing, whereas He blesses charitable deeds with manifold increase. And Allah does not love anyone who is stubbornly ingrate and persists in sinful ways. Verily, those who are faithfully secure in their commitment [to Allah] and do good works, and have made Salah the standard [of life], and [institutionalized] the dispersion of charitable givings — they shall have their reward with their Sustainer, and no fear need they have, and neither shall they grieve. O you who are faithfully secure in your commitment [to Allah]! Remain on guard regarding Allah’s [power], and give up all outstanding gains from usury, if you are [truly] committed [to Allah]; for if you do not, then know that you are at war with Allah and His Apostle… (2:276–279). But where are the foot-soldiers for this war? They are busy in their saudi-sponsored masjids in getting high during their qiyam al-layl and endless qunut trances while Riba moves the majority of the world’s people into debt slavery. They are secluded in their ascetic i‘tikaf, which teaches them to smile at every adversity, while the world they should be correcting is falling apart all around them. Riba is the cause, poverty is the result, and Ramadan, when the Qur’an was made to be the most accessible, was meant to be the antidote, “…if they only knew.” furthermore, in light of these alarming statistics, let us consider the other side of the picture: affluence among Muslims. And let us zero in on the Arabian peninsula where Allah’s (SWT) final message was revealed to His beloved prophet (SAW) for the first time in the month of Ramadan. Contrary to Allah’s (SWT) command and the sunnah of the noble Messenger (SAW), the Arabian peninsula has been renamed “saudi” Arabia as if it is a piece of real estate owned by a family (nastaghfir-Allah). This amounts to shirk because only Allah (SWT) is the owner, lord, and sustainer of everything on earth as well as in the universe and beyond. The natural resources of this family-run fiefdom have been usurped by hordes of “princes” who have made the petro-windfall their personal fortunes. According to the International Monetary fund (IMF), saudi oil income was more than $324 billion in 2011; add to that the income from other sources such as pilgrimage revenues, and the figure easily surpasses the $360 billion mark — nearly $1 billion/day.12 Given the extreme poverty and hunger in the world, especially among Muslims, have the saudi “royals” ever considered what Allah (SWT) demands of them while they don the mantle of Khadim al-Haramayn (Custodians of the Two Holy places) and put on an air of contrived taqwa? We must assume that these “royals” offer their daily salahs and fast in Ramadan. Why is it, then, that the social consciousness, which fasting is supposed to nurture, is lacking among them? How can they sleep easy when the prophet (SAW) said, “…a community breaking its fast while one among them is hungry will not be accepted by Allah”?13 Are not the Muslims supposed to be one brotherhood in which the needs of the (deprived) one are as important as the satisfaction of the many, or the needs of the many are as necessary to fulfill as that of the (wealthy) one? Where is the brotherhood of Islam and the Ummah of Muhammad (SAW) that we are supposed to nurture? Why is it that the saudi “royals” and their ilk have protruding bellies from overeating while the children in Somalia and Sudan have skeletal frames because of extreme malnutrition? To fulfill the nutritional and health needs of all the poor people in the world requires a total of $13 billion annually.14 This is truly a paltry sum when one considers that it is less than 1% of the global military expenditure of $1.738 trillion in 2011. While the us accounted for 41% of this total, or $711 billion, saudi Arabia, claimant to the title of the holy of holies in the Muslim world, also spent $42 billion on weapons purchases.15 Why does saudi Arabia need to spend such huge sums on weapons each year when their soldiers are incapable of using them to defend Publisher’s the kingdom? In the end of 2009, when saudi troops blundered into attacking Houthi tribesmen in North Yemen, hundreds of them surrendered after a brief skirmish. The saudi regime had to pay a huge ransom to the tribesmen to secure the release of its troops. Has this country and its leaders shown the desire and intention to use these weapons against generational Muslim enemies like the Yahud and the Nasarah (Zionism and imperialism), or are they more content in using them to pummel Islamic self-determination so as to delay the day of their inevitable reckoning in front of the suffering Muslim masses? O you who are securely committed [to Allah]! If you pay heed to some of those to whom revelation was vouchsafed aforetime [Jews and Christians], they might cause you to renounce the truth after you have come to commit [to it]. And how could you deny the truth when it is to you that Allah’s ayat are being conveyed, and it is in your midst that His Apostle lives? But he who holds fast unto Allah has already been guided onto a straight way (3:100–101). And devour not one another’s wealth wrongfully, nor approach with it decision makers with a view to devouring sinfully, and knowingly, anything that by right belongs to others (2:188). Money, especially concentrated wealth, infused into the decision-making process (capitalism/democracy) corrupts Publisher’s Foreword xix public political representation as surely as a truthful criterion ennobles and refines it. Dirty money commingled with dirty politics led to the “dirty democracy” (as earlier characterized by former us secretary of Defense Donald Rumsfeld during the Iraq War of 2003), which tolerated a dirty military brass all the way up until its dirty generals, sponsored by dirty (us) presidents, did away with dirty democracy altogether. The first generation of Muslims observed only nine Ramadans in the company of the noble Messenger of Allah (SAW). In those nine years, they not only transformed the Arabian peninsula but also spread its liberating message to lands beyond. And within 50 years of the prophet’s (SAW) departure from this earthly abode to join heavenly company, the Muslims had spread the message of Islam to most of the known world. This was only possible because Muslims rose above divisions of race, tribe, and nationality by establishing social and economic justice in society. And Ramadan with its taqwa-building imperative played an important role in it. Today, Muslim rulers and elites have institutionalized racism, inequality and “national sovereignty” into every facet of life and abandoned the commands of Allah (SWT). Is it surprising that Muslims are humiliated and despised almost everywhere? Allah (SWT) has made Taqwa the criterion for one human being to excel another (49:13). When family, race, tribe or “nation” becomes the determining feature for establishing class hierarchies and institutionalizing economic disparities between different groups of Muslims, humiliation is sure to follow. Muslims will have power when they respect Allah’s (SWT) power — that is, when they have taqwa. Muslims will be weak and humiliated when their public persona is socialized into conformity to man-made power centers or laws. fasting in Ramadan offers Muslims the opportunity to break from man-made laws and to conform to the commands of Allah (SWT) to achieve a life of dignity and honor that He, the Almighty, has promised to His faithful servants, by achieving taqwa. This booklet has been extracted from Volume 2 of Imam Muhammad al-'Asi’s tafsir, The Ascendant Qur’an: Realigning Man to the Divine Power Culture. As with the original tafsir, this piece on Ramadan is also edited by ‘Afeef Khan, and includes generous contributions from Sr. Marjan Asi. It is our hope that such extracts will provide readers easy access to important issues discussed in the noble Qur’an and will encourage them to engage the more detailed tafsir with renewed interest and enthusiasm. 4. Trickle up staff, Living on Less Than $1.25 a Day. (New York, New York: Trickle up website, www.trickleup.org). http://www.trickleup.org/poverty/extreme-poverty.cfm. 6. Department of Economic and Social Affairs (DESA) of the United Nations Secretariat, The Millennium Development Goals Report 2010. (New York, New York: UN Department of Economic and Social Affairs, 2010), pp. 30–39 (Goal 5). 9. DESA, The Millennium Development Goals Report 2010. pp. 26–29 (Goal 4). 11. Patricia Moccia (Editor-in-Chief), The State of the World’s Children, Special Edition. (New York, New York: United Nations Children’s Fund (UNICEF), 2010). 13. Mahmoud Ayoub, Islam: Faith and Practice. (Markham, Ontario, Canada: The Open Press (Holdings) LTD, 1989), p. 124. 15. Bates Gill (Editor & Publisher), Stockholm International Peace Research Institute (SIPRI) Yearbook 2011: Armaments, Disarmament and International Security. (Oxford, UK: Oxford University Press, 2011).